Our church has a sizable number of older women. Why? What task would the Lord give these sisters in His church? Like the older men, the older women of the congregation are a God-given resource for building up the congregation. This is what Paul draws out in his instruction to Titus when he’s told to ensure that “older women … are to be reverent in behavior, not slanderers or addicted to much wine. They are to teach what is good, and so train the young women…” (Titus 2:3,4a). The term ‘older women’ directs our thoughts to those sisters in our midst who have been around the block a few times. By virtue of the time they’ve already spent in God’s school-of-life, they have the life experience to be able to touch others in a helpful manner. We do not know whether the “older women” Paul speaks about on Crete were married, single or widowed. Undoubtedly, as with us, some were married, while others were single – be it that they had never married or were now widowed. In any case, Paul does not speak here about the “older woman’s” role in relation to a husband; he speaks instead about their role as “teachers”. So it’s this role we need to draw out now. The Lord God in the beginning created two people, a man and a woman, to image Him, and gave them the command to “be fruitful and multiply and fill the earth and subdue it and have dominion over” all creatures (Genesis 1:28). God’s intent was that the earth would be filled with people who, in the way they interacted together and cared for God’s world, would reflect what God was like. Yet the children to be born would not know from instinct how to image God; they would need to be taught. This was, of course, the parents’ task, with Eve as mother to play a central role. The longer Eve spent in the school of life, the better she would get to know God – and so the better equipped she’d be to teach those who come after her what service to God ought to look like. This task would, of course, be true not just for her, but also for her daughters in the generations. “Older women”, wizened by years in God’s service, have a vital role to play for the benefit of those less schooled in life. The fall into sin complicated the task profoundly, but did not alter God’s intent for the “older women”. It’s no surprise, then, to find Miriam teaching the women of Israel. She’s Moses’ older sister (cf Exodus 2:7), and Moses was 80 years old when the Lord sent him to Egypt to deliver His people (Exodus 7:7). With the exodus now behind them, Miriam led the women with tambourines and dancing to sing the Lord’s praise on account of His redeeming work (Exodus 15:20f). Similarly, the “excellent wife” of Proverbs 31 “opens her mouth with wisdom, and the teaching of kindness is on her tongue” (vs 26). Anna at 84 years of age spoke readily of the newborn Savior “to all who were waiting for the redemption of Jerusalem” (Luke 2:36ff). Old Testament material as this forms the foundation upon which Paul builds his instruction to Titus concerning what needs to be done to build up church life on Crete. Titus must ensure that “older women … teach what is good” – an instruction fully in line with God’s earlier revelation. Yet to be effective in teaching, these older sisters need particular behavior, ie, they need to walk the walk before they can credibly talk the talk…. So Paul tells Titus to ensure that the older women are “to be reverent in behavior, not slanderers or slaves to much wine”. The term translated as “reverent in behavior” is literally: “in behavior befitting a temple”. It’s a formulation full of gospel, and hence of grateful obligation. The Lord God had told His people at Mt Sinai to build a house for Him, so He could dwell with them. The tabernacle Israel built had the Holy of Holies in the back and the people outside, with the altar for sacrifices in between. The altar spoke of the work Jesus Christ was going to do; He’d sacrifice Himself on the cross to atone for our sins so that sinners might be reconciled to God. It’s obvious: if you are a temple, you need to live a lifestyle befitting that status. That’s what Paul wants Titus to impress on the “older women”; they are to act the part. Of course, others of the congregation are to act the part too, but Paul is now concerned specifically that the older women be what they are because God has entrusted a teaching role to them. The book of Leviticus assumes the completion of the tabernacle God wanted Israel to build. The first 7 chapters detail how the sacrifices on that altar-between-God-and-the-people had to be done, while Leviticus 8 explains who had to perform the sacrifices on that altar. Chapter 9 describes the ordination of the priests, and then ends with Aaron blessing the Israelites and the glory of the Lord appearing to the people. Exciting day: God and sinners living together in harmony; something of Paradise is restored! The sons of Aaron got caught up in the excitement of the moment, says Leviticus 10, and in their enthusiasm volunteered a sacrifice on that altar. Bam: “fire come out from before the Lord and consumed them, and they died before the Lord” (vs 2). How tragic…, and the lesson so obvious: God is holy. Somehow, spontaneous sacrifice was behavior not “befitting the temple”. Now that the Holy Spirit has been poured out on Pentecost, the point is even truer for New Testament temples. The “older women”, teachers (and hence models) as they are, need to adopt behavior “befitting a temple”, and that’s to say that in their service of God they are to be even more particular & careful than priests of Leviticus 10 (and hence of the Old Testament). For God remains God! That ‘teaching’ happens through the example of the “older women” – and Paul is happy to flesh that out in further detail still. Paul follows the instruction to live in a fashion “befitting a temple” with the command “not to be slanderers.” The word translated here as ‘slanderers’ is actually the same word that appears repeatedly in the Bible as the name of the Devil: Diabolos, a word that describes the notion of sowing confusion. Slander, of course, does exactly that to someone’s reputation, and so is evil and ungodly. The “older women” of Titus’ congregations were to avoid it. The Lord God responded to Aaron’s sons’ spontaneous worship with heavenly fire and death. One could understand very well that Aaron would be tempted to respond to God’s deed with some serious criticism of God’s high standards. Moses, however, reminded Aaron of God’s holiness, with as result that “Aaron remained silent” (Leviticus 10:3). He did not slander God’s good name despite the anguish he undoubtedly felt at the death of his boys, nor did he sow confusion among the people about what kind of a God they had. Since God had come to live among the people in the tabernacle, the people needed to conduct themselves as persons “befitting the temple” – and by his remaining silent, not slandering, Aaron exemplified precisely that sort of behavior. The “older women” of Crete, now, were to adopt behavior befitting a temple. Part and parcel of that behavior was that they would not slander God’s good name, be it through their own misconduct or through giving someone else occasion to think or speak evil of God. In fact, their words were always to be inspiration for others to think highly of God and of His deeds in our daily lives, and so to praise Him. Wine (and it’s true of all alcoholic drink) is a gift from God. God told Adam and Eve on the day of their creation that “I give you every seed-bearing plant on the face of the whole earth…” (Genesis 1:29). God also told them that they were to “rule over” all creation (Genesis 1:28) – and that obviously means that they were to see to it that no created thing ruled over them. To be ruled by alcohol, then, is sin. That’s true in terms of addiction, and is true too when one is ‘under the influence’. Hence the Bible’s repeated instruction to use wine in moderation, cf Prov 23:19-21; 1 Tim 5:23. The older women of Crete were to take this Biblical instruction to heart. Again, though, one wonders why Paul would mention this matter to Titus. Did the older women of Crete have a problem with alcohol? That “Cretans are … lazy gluttons” (1:12) could suggest it was so. But again, Leviticus 10 sheds some other light on the matter. For after the bodies of Aaron’s two dead sons were carried away from the tabernacle, “the Lord said to Aaron, ‘You and your sons are not to drink wine or other fermented drink whenever you go into the Tent of Meeting” (vs 8f). As the priests labored at the altar in God’s presence, they should be clear-headed and in full control of their faculties; God, after all, was holy. Given that the “older women” of Crete –teachers as they were to be- were to behave in a manner befitting temples, it follows that nothing should becloud their judgment; always they should be clear-headed. Good judgment, of course, is what one requires if one is to “teach what is good” and so “train the younger women” (2:3,4). We’d already drawn out above that the Lord had assigned a teaching role to the women, with its focus on the coming generations. Strikingly, though, this again is an echo of Leviticus 10. For after the Lord had forbidden Aaron and his sons to “drink wine … whenever you go into the Tent of Meeting,” the Lord added this instruction: “You must distinguish between the holy and the common, between the unclean and the clean, and you must each the Israelites all the decrees the Lord has given them through Moses” (Leviticus 10:10,11). In chapters 11-15 the Lord expanded on clean and unclean foods, animals, fish, clothes, houses, etc. The point of the instruction was that Israel was to know that they were holy, and therefore different from the nations; they were to tolerate no sin in their lives. This point required teaching, and that task fell to the priests as they labored in the tabernacle – and they, for the sake of teaching clearly, had to be alcohol free. Again, the priests were to “teach the Israelites all the decrees the Lord had given,” and that includes instruction about all the main points of doctrine as the Lord taught it through the laws. Let no one misunderstand. Paul is not saying –and I am not either- that the “older women” are to receive a place of leadership in the church. The Holy Spirit moved the apostle elsewhere to write, “I do not permit a woman to teach or to have authority over a man; she must be silent” (1 Timothy 2:12). Yet Paul would not have women pushed into a corner as if they have no role in the congregation! Very deliberately Paul uses language in Titus 2:3 that is borrowed from Leviticus 10, about the priests’ role as teachers, and applies that instruction to the “older women”. As Paul seeks to build up church life in Crete, he would have the older women play a vital role!! Yet that vital role is not directed to the congregation in its entirety, but is directed to the “younger women” of the flock. These “younger women” also have a critical role to play (see next Bit to Read) but Titus can’t reach them so easily. So, in relation to these younger women, the older have that position of teaching – as a clear echo of God’s intent in Genesis 1. Paul would not have the older women of Crete –or of today- cloistered in some seniors’ club, or perhaps forever away on a cruise. He sees the women playing a vital role in the growth of the congregation. These sisters –they’ve spent years in God’s school of life- are a rich resource in the church of Crete, for the congregation’s edification. The same is true today. 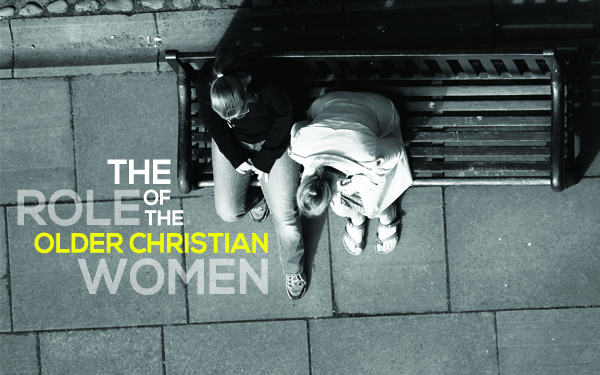 The Lord God has left a goodly number of older women in the congregation -why?- because He says that we need them! There are so many younger women in the congregation, from mothers of busy households to mothers of small households to sisters with yet no children or even no husband yet. These younger women are, by God’s ordinance, helpers to (today’s and) tomorrow’s office bearers, school board members, businessmen and fathers; these young women are also mothers to the next generation of church leaders. Obviously, these young women play a pivotal role in the church life. That is why they need all the guidance, encouragement and help they can get. By God’s ordinance, it is the role of “the older women” to give that help. The older are under divine obligation to speak with their daughters (in-law), their children’s friends, and other “young” sisters of congregation. Certainly, women’s society is one forum where that conversation can happen. But be honest: when the older sisters were younger years ago, they didn’t commonly open up on life’s real burdens to a virtual stranger, let alone at in public meeting. That takes privacy, and the openness that comes with familiarity. Point: let the older sisters get into the homes of the younger; nothing beats a coffee together. Instead of lamenting how younger mothers struggle to cope with the challenge of keeping their children under control, invite a couple of these mothers over for a visit (ah, yes, let the husbands join the ladies…), and share some nuggets on childrearing as you’ve learned it over the years. Older sisters: the Lord God has not put you out to pasture! On the contrary, you have received the Holy Spirit in full measure. Pentecost is reality: “Even on my servants, both men and women, I will pour out my Spirit in those days, and they will prophesy” (Acts 2:38). In the confidence that the Lord gives a task and equips to carry it out, search for ways to touch the younger of the congregation. So you can “still bear fruit in old age…, proclaiming, ‘The Lord is upright; He is my Rock” (Ps 92:14f).